Black Mountain Jeep (stylized as 'BLKMTN') is located in Wylie, TX and was brought to fruition by Dennis Collins. 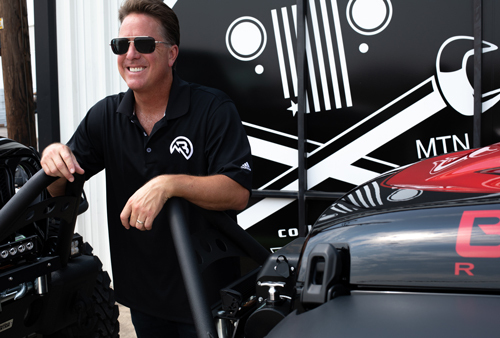 Dennis is no stranger to the Jeep industry, and in fact, plays a huge role in its moving parts because for over 3 decades Dennis and his Texas-based shop called Collins Bros Jeep specialize in just that, the JEEP. More specifically, the 1976 – Current CJs and Wranglers. "EQUIPPED FOR THE ROAM AHEAD"
Nowadays you may spot the BLKMTN brand on a couple different media outlets like Gas Monkey's Fast n' Loud or Garage Rehab with Richard Rawlings. BLKMTN has been expanding its reach since 2007 and Dennis and the team plan on rolling out innovative products for the Jeep community as often as possible.